Copy Cats Review : You will never see your cat the same way again ! Welcome to the wonderful world of cats imagined by the Swedish slot provider NetEnt . 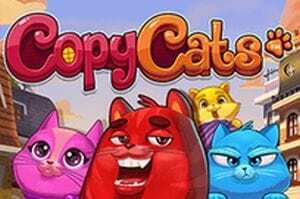 The main heroes of the game COPY CATS are colourful cats walking around the city which one must catch in order to hit a big win or even a mega win of £25,000. The game is carried by a swinging jazzy tune which gives way to the sound of reels spinning, evoking traditional land based slot machines. COPY CATS slot features 3 different cat symbols, each one of them with their own colour, personality but also its own payout value: the red cat bearing a broad smile and raising his eyebrows as if to charm his public, the pink cat wearing a bow around her neck, fluttering her eyelashes in an attempt to melt the heart of the players and finally the grumpy blue cat sticking his tongue out. As regards the Wild symbol, it is represented by a charming golden cat fooling around with a ball of yarn. The minor symbols represent everything cats love and which is therefore necessary to anyone wishing to capture them: a mouse shaped toy, some milk and some fish. Finally, the lower value symbols are depicted by colourful cat paws, which all share the same payout value in the paytable (25 coins multiplied by the bet level and the coin value for a winning line of 5 symbols), all these clues enabling us to keep track of them! The Free Spins have been designed in a truly remarkable way. To trigger them, one must obtain 3 bonus symbols, namely 3 cat bells. After obtaining the first two, the last reel literally finds itself under the spotlight, showered in confetti as it starts spinning again and again, the suspense reaching its peak for the player. The vibrant colours and cartooning style paired with the animation used for the symbols and the soundtrack chosen by NetEnt has resulted in a refreshing video slot full of life, which does not leave any doubt on the fact that this game is recent. As a matter of fact, it was launched in May 2017, and may be played on various media including tablets, smartphones and PC. COPY CATS is a 5-reel online slot with 3 rows and 25 fixed bet lines going from left to right. It features a classic slot engine enlivened by a great number of special features: Free Spins, Bonus symbols, Wild Substitutions, Stacked symbols, Stacked Wilds and Copy Cats Feature. In the main games, winnings are made from the moment where the gambler obtains three identical winning symbols from left to right on one fo the 25 winning bet lines. In the paytable, the classic symbols with the highest payout value are the cats, the red one bears the highest value: 200 coins multiplied by the bet level and coin value for a winning combination featuring 5 of them. Then comes the pink cat (150 coins for a payline of 5 symbols) followed closely by the blue cat (100 coins). The mouse, the milk and the fish are lower value symbols, and lastly the cat paws are the lowest paying symbols, with a prize of 25 coins for a complete line on 5 reels. It also features a Wild symbol which may serve as a substitute for any other symbol -besides the Bonus Symbol- to form winning combinations on the bet lines. But that’s not all – some of these symbols have plenty of surprises in store for gamblers, for when the first reel is made up exclusively of symbols representing the same cat or the Wild, it triggers the Copy Cats Feature, offering a chance of hitting a big win, perhaps even a mega win. That video slots offers a high total payout of 96.76% (69.12% in the main game including Copy Cats feature and 27.64% during free spins). The Copy CATS feature has a hit frequency of 5.1%, may be triggered by stacking three cat symbols or wild symbols, which means the gambler must fill reel 1 with the same cat symbol or with Wild symbols . The Copy Cat feature offers an incredible opportunity of making high wins, for all the other cat and Wild symbols obtained on reel 2 to 5 are replaced by the stacked symbol for that round. This game also includes a Free Spins feature which is activated with the use of the Bonus Symbols. The latter only appear on reels 1, 3 and 5, but may be placed on any other line to trigger the 10 Free Spins. The hit frequency for the COPY CATS slot Free Spins is of 0,84% (on average once every 119 spins). If 3 Bonus symbols appear once more on the 1st, 3rd or 5th reel during the Free Spins, an additional 10 Free Spins will be activated. The online video slot COPY CATS is a little wonder which offer tremendous opportunities for gamblers thanks to its 25 winning bet lines, but especially by the means of its Free Spins and its Copy Cats Feature. In the main game, the maximum payout is of £25,000. In the Free Spins, the max win stays the same (£25,000). These special features are what gives this video slot game its originality and which makes it so exciting for gamblers. They will surely be enthralled by the Copy Cats Feature which offer a chance of winning some mega wins. According to the information concerning the payout of this game, they reappear on average every 1 spin out of 19.5 (5.1%). Gamblers may play on this slot machine at High Roller, with a minimum bet of 25p and a max bet of £125.